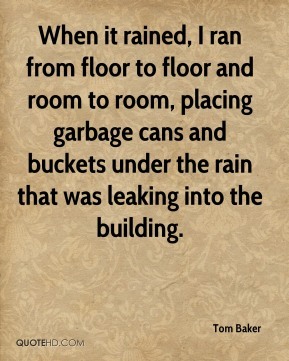 When it rained, I ran from floor to floor and room to room, placing garbage cans and buckets under the rain that was leaking into the building. Dave was a consummate entertainer. 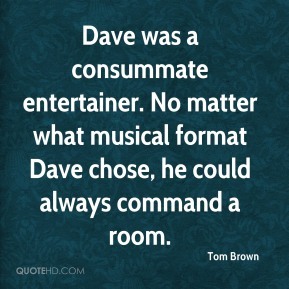 No matter what musical format Dave chose, he could always command a room. 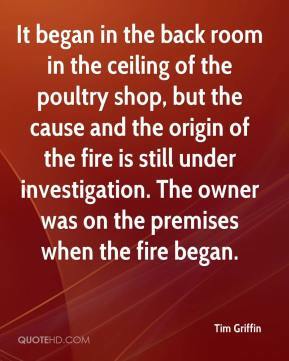 It began in the back room in the ceiling of the poultry shop, but the cause and the origin of the fire is still under investigation. The owner was on the premises when the fire began. 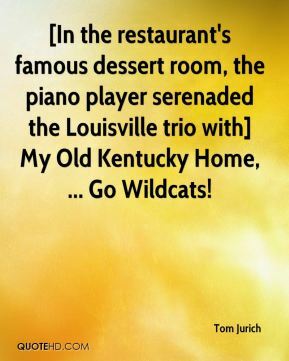 [In the restaurant's famous dessert room, the piano player serenaded the Louisville trio with] My Old Kentucky Home, ... Go Wildcats! They just realized that they just did not have the room within the budget. 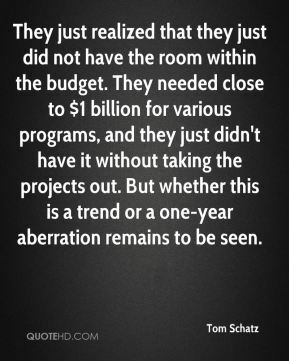 They needed close to $1 billion for various programs, and they just didn't have it without taking the projects out. But whether this is a trend or a one-year aberration remains to be seen. It was quiet in the locker room, but it wasn't down. Everybody had confidence in us getting that win. I think it?s there. 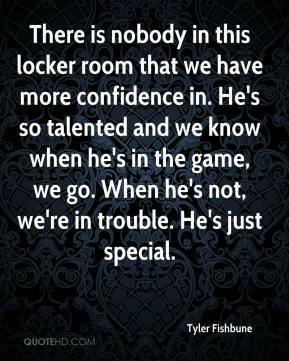 I don?t think any player in our dressing room is worried about the challenge that?s ahead of us. 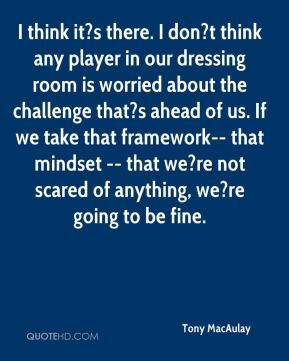 If we take that framework-- that mindset -- that we?re not scared of anything, we?re going to be fine. 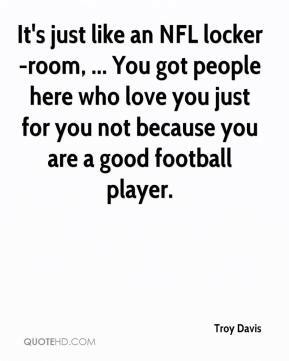 It's just like an NFL locker-room, ... You got people here who love you just for you not because you are a good football player. If they don't show up, they're not going to play. 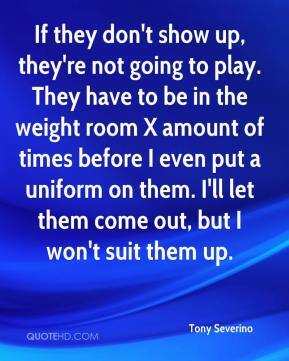 They have to be in the weight room X amount of times before I even put a uniform on them. I'll let them come out, but I won't suit them up. We had never lost power like that in the entire building. 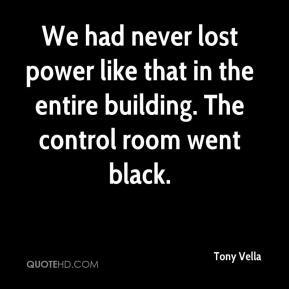 The control room went black. 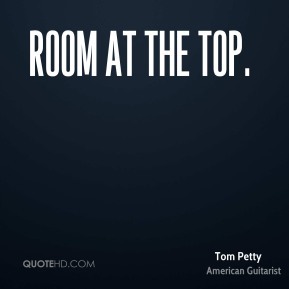 We don't have room for any mistakes right now. 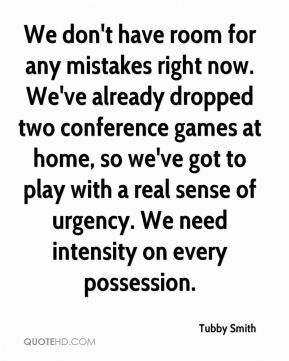 We've already dropped two conference games at home, so we've got to play with a real sense of urgency. We need intensity on every possession. Our [locker] room is better than you might think it'd be. It's tough when you're losing, but the spirits aren't as low as people might think. We're closer to turning it around than you might think. 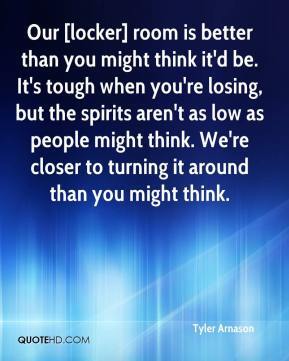 There is nobody in this locker room that we have more confidence in. He's so talented and we know when he's in the game, we go. When he's not, we're in trouble. He's just special. We've got a veteran team and we're playing some good, solid baseball right now. 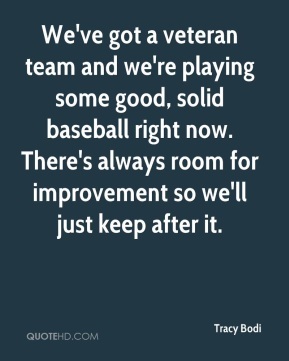 There's always room for improvement so we'll just keep after it. 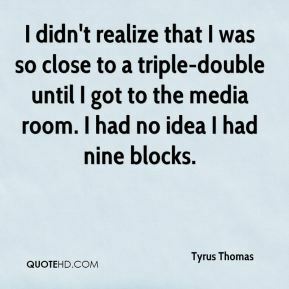 I didn't realize that I was so close to a triple-double until I got to the media room. I had no idea I had nine blocks. 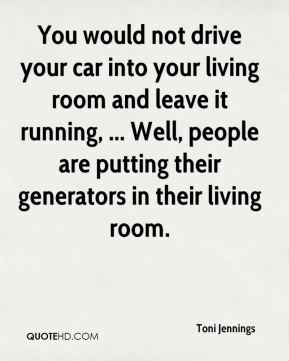 You would not drive your car into your living room and leave it running, ... Well, people are putting their generators in their living room. He's got a ways to go. 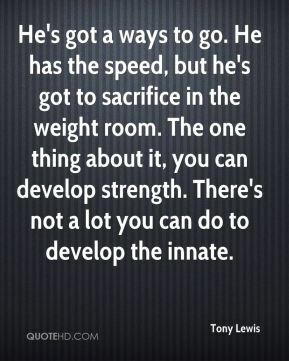 He has the speed, but he's got to sacrifice in the weight room. The one thing about it, you can develop strength. There's not a lot you can do to develop the innate. We don't have any room for any mistakes right now. 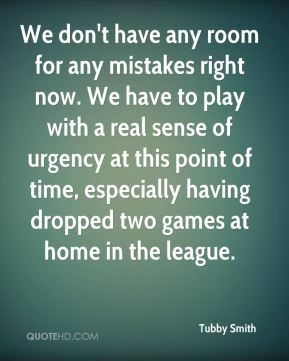 We have to play with a real sense of urgency at this point of time, especially having dropped two games at home in the league. I am planning to create some sort of garden scene upstairs in the examination room. 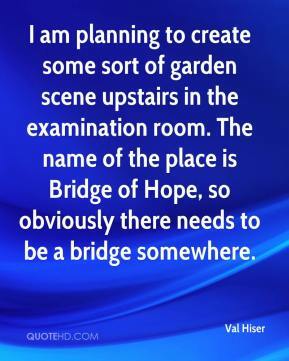 The name of the place is Bridge of Hope, so obviously there needs to be a bridge somewhere. I sincerely hope you have also learned from this awful experience. 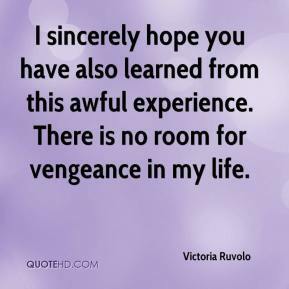 There is no room for vengeance in my life. 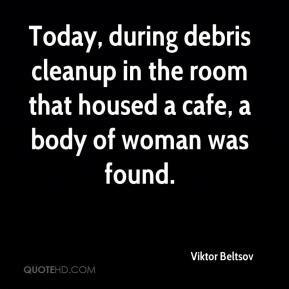 Today, during debris cleanup in the room that housed a cafe, a body of woman was found. As a captain, I knew coming out of the locker room that I had to step up. 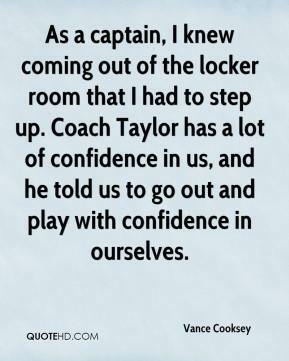 Coach Taylor has a lot of confidence in us, and he told us to go out and play with confidence in ourselves. We have a special feeling in the locker room. There's always room for improvement. My greatest weakness is my strength and whatever school I choose is getting me on a workout program. 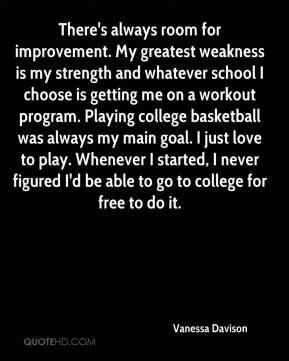 Playing college basketball was always my main goal. I just love to play. Whenever I started, I never figured I'd be able to go to college for free to do it.